I’m sorry, I can’t help it. 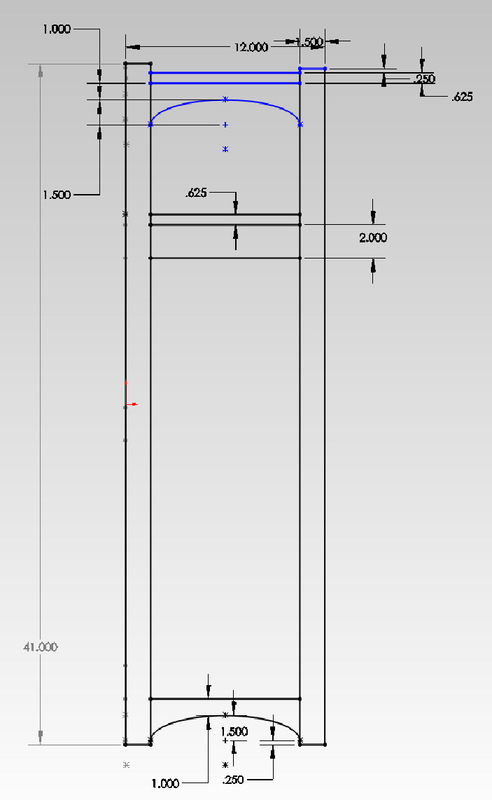 Having drawn out the front and rear view of the Limbert 305 1/2 cabinet the other day I really wanted to see what it might look like if I built it. I decided that the proportions of the various parts in my initial drawing were close enough. I settled on a series of 1/8″ set backs — the edges of the top and sub-top are are in 1/8″ from the legs, the rails are set back 1/8″ from the top, the door is set in 1/8″ from the rails, etc. In the drawing from the catalog the panels in the front and sides look to be either ship-laped or tongue-and-groove construction, so that’s how I set up the model. I did do some of the joinery in the CAD model (for example, the mortise and tenon construction) but I didn’t model all of the joinery. I just wanted to see what it looks like, if I decide to make it some day I’ll sort out the rest of the construction details that I glossed over. So here is what I came up with. There are a few construction details to sort out, but it should be pretty straightforward to build if someone wants to do it. I think the slats fir the panels make it a little more interesting. 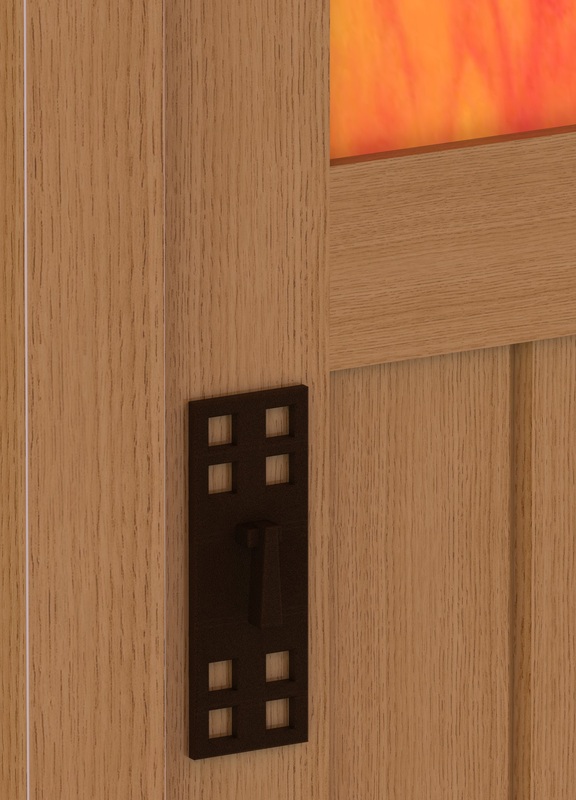 The finish needs to be darker, but getting a truly realistic wood rendering in SolidWorks is something I’m still playing with. It takes a lot experimentation and fussing around, at least it takes that for me to do it. 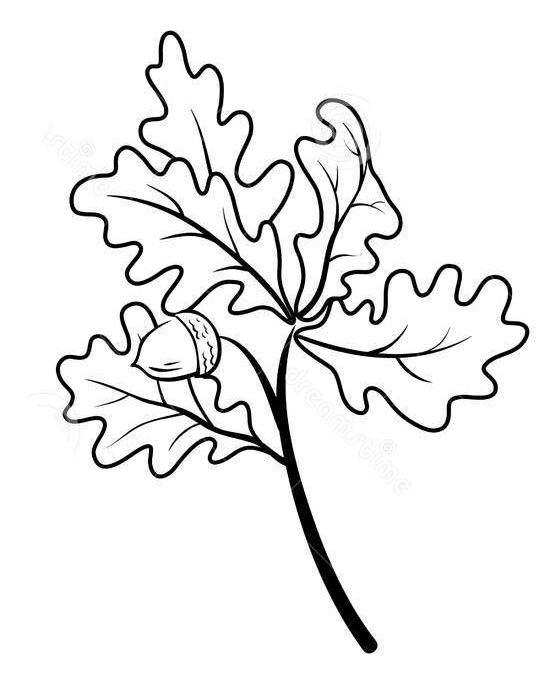 This is just a standard 2D oak from the materials library. The glass is an actual photograph of the glass applied as a “decal” to the surface with some luminescence to make it pop a little more. 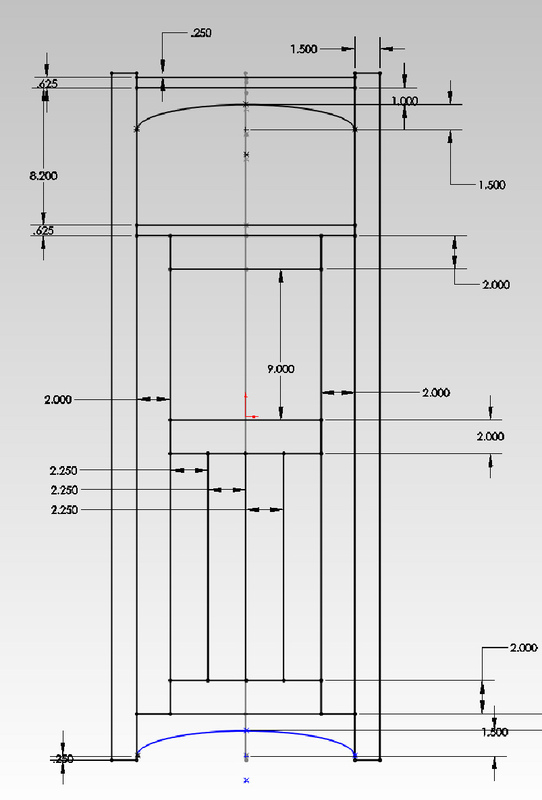 Sometimes I think CAD should stand for “Computer Aided Distraction”, but I suspect the real flaw lies somewhere deep in my psyche. This weekend I hope to crank on the stained glass for the door in the cabinet I’m making, but I’m already thinking ahead to the next project. 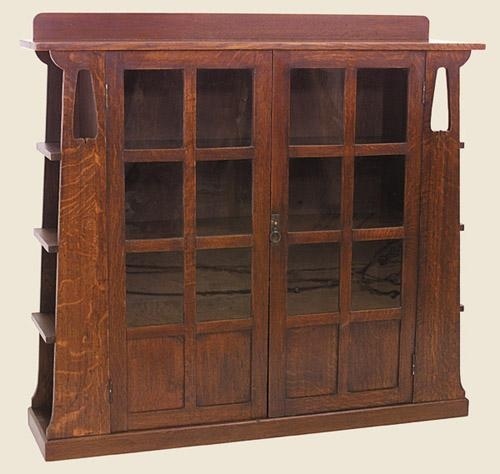 I want to make a clone of the Limbert 355 or 356 bookcase. They are the same except one is wider by the addition of a second door, which is probably the version I’d make as we always need more storage space for books. I think the 355 single door version is a little more elegant though. Well, one thing leads to another, as it often does, and I bought a reprint of the 1903 Limbert catalog hoping to find more information on this bookcase. Turns out it doesn’t show up until the 1904 catalog. 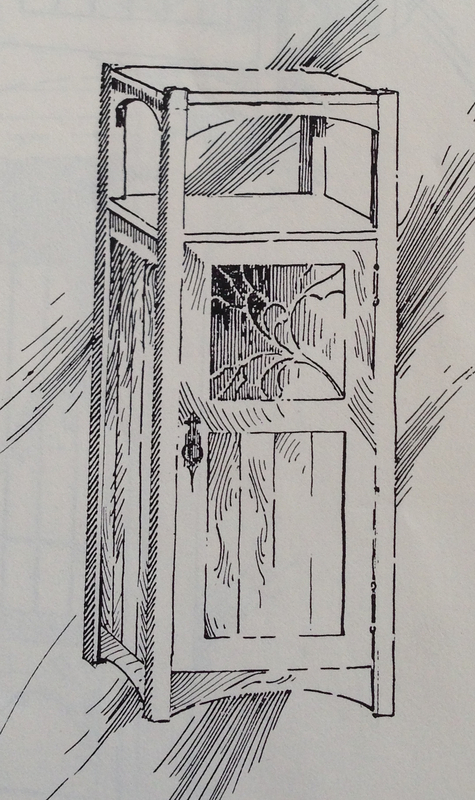 But…there was this interesting “cabinet” in the 1903 catalog. No. 305 1/2. Cabinet. 12″ deep, 16″ wide, 41″ high, oak, opalescent art leaded glass in upper panel of door, finished in any color. Price, $17,00. It struck me as an odd piece, and since the catalog only shows a simple line drawing I was curious. I googled for extant example, but came up empty. So I decided to model it in CAD to see what it might look like. Starting from the overall dimensions I started setting the sizes for various parts by eye. I think I’m pretty close, although line drawings like this are inherently inaccurate. Think about building something from an Escher drawing. Before I actually model it in 3D I need to think about material thicknesses, joinery and setbacks.